TOTOWA, N.J., May 26 , 2011 – Dydacomp, a leading provider of business technology platforms for eCommerce and multichannel merchants, announced today that SiteLINK eCommerce clients experienced a double digit increase in eCommerce revenue during the first quarter of 2011 compared to the previous year. 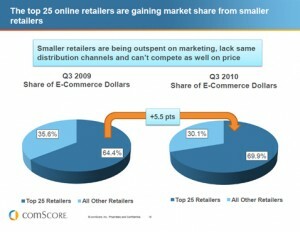 This growth was in line with the eCommerce industry that, as a whole, saw a 12% increase in eCommerce revenue during the first quarter of 2011 over the same period a year ago, according to comScore Inc. The average SiteLINK store’s growth was fueled by an impressive 11% increase in orders per day, as well as a continuing uptick in average order size throughout the first quarter of 2011. This trend appears to be continuing into the second quarter across all verticals, while certain verticals are showing a stronger than average growth at the start of the second quarter. For example, SiteLINK jewelry merchants saw a 46% increase in ecommerce revenue during the first month of the second quarter compared to the previous year. These jewelry merchants also experienced an impressive 80% growth in average order size year-over-year during April 2011. Another vertical that experienced a promising start to the second quarter was the SiteLINK home furnishing merchants. These merchants saw ecommerce growth with a 21 % increase in online revenue in April 2011 and a 23% increase in average order size year-over-year. Dydacomp will be demonstrating SiteLINK eCommerce and Multichannel Order Manager at the Internet Retailer Conference and Exhibition in San Diego June 14 – 17 at Booth 1204. First Data Update for M.O.M. Our programmers here at Dydacomp have been working to implement the security and connectivity enhancements that First Data has recently released for their payment Gateway that was custom built for the Multichannel Order Manager system. First Data is one of the payment processing gateways utilized by M.O.M. and SiteLINK eCommerce users here at Dydacomp. The new update will increase the functionality of the payment processing gateway on Windows 7 and will have a more secure connection. This more secure connection will prevent dropped card authorizations. However, this issue was not due to the connection between M.O.M. and First Data, as it mostly occurred on workstations running Windows 7. Our team here at Dydacomp is currently finalizing the beta testing and the updates are set to release early next week. We will be sending out an email to inform users when the release is available for download, so keep an eye out in your inbox for this announcement. If you have any questions or concerns, please contact Dydacomp Technical Support. The support team is available Monday – Thursday 9 AM – 6:45 PM EST and Friday 9 AM – 4:45 PM EST. You can also contact support via the online ticketing system by clicking here. The first step in getting in contact with M.O.M. and SiteLINK support would be to fill out a support ticket online and we would ensure that the accurate technical support representative contacts you to resolve your issue. To contact Multichannel Order Manager support by phone call (973)237-0300 and SiteLINK support by pressing 2 after connecting. New customers looking to contact sales to find out information about purchasing M.O.M. for the first time call (800) 858-3666 and press 4 after connecting. Existing customers looking to contact sales for upgrade information or any other need call (800) 858-3666 and press 3 after connecting. You can also email Dydacomp Sales at Sales@dydacomp.com. For Billing inquiries, please contact your sales representative at (800) 858-3666. Michael Chichester is the payment processing expert here at Dydacomp that will help you make the best decision to save you money in your overall fees. If you decided that you wish to add custom features to your SiteLINK store, please email sales@dydacomp.com or contact Joe Fantozzi at (800) 858-3666 ext 245. If you are looking for Multichannel Order Manager custom work, email implementation@dydacomp.com or contact Paul Mendelsohn at (800) 858-3666 extension 730. To order integrated forms, envelops, labels, and other materials for your business to work in Multichannel Order Manager contact Software Forms at Brian_Gill@softwareformsplus.com or visit the Software Forms Plus website. To get information for a first time install or SiteLINK site setup please contact the implementation department at implementation@dydacomp.com or call (800) 858-3666 extension 730. This will allow your project manager or Implementation engineer to follow up with your inquiry. If you have any issues, please feel free to contact me at (800) 858-3666 ext 235 or email me at mike.n@dydacomp.com or comment below!